One of the limitations of both screen-film (i.e. analogue) and digital mammography is that the standard two-dimensional projection has healthy and pathological tissues that overlap each other. Cancerous lesions can thus be hidden, particularly when they are embedded in dense surrounding tissues. The field of breast cancer diagnosis received the news earlier this year that the Food and Drug Administration (FDA) of the USA had approved a digital breast tomosynthesis system submitted by Hologic Inc. Breast imaging had gone 3D. But what is tomosynthesis and does it have the potential to transform breast cancer screening and diagnosis? Digital breast tomosynthesis, or DBT, is a technique in which 10 to 12 projection views over an arc of about 30 degrees are acquired, and then the 3D volume of the breast is reconstructed from the multiple 2D projections using a mathematical algorithm. Although the words tomosynthesis and tomography have the same root – the Greek word tomos meaning “to cut” – they are not quite the same thing. In tomosynthesis, a limited set of images is taken over an angular range that is less than 90 degrees, whereas in computer tomography, or CT, a complete set of images over a range of at least 180 degrees, is acquired. The benefit of tomosynthesis, therefore, is that the patient is subjected to considerably lower levels of radiation compared with CT. 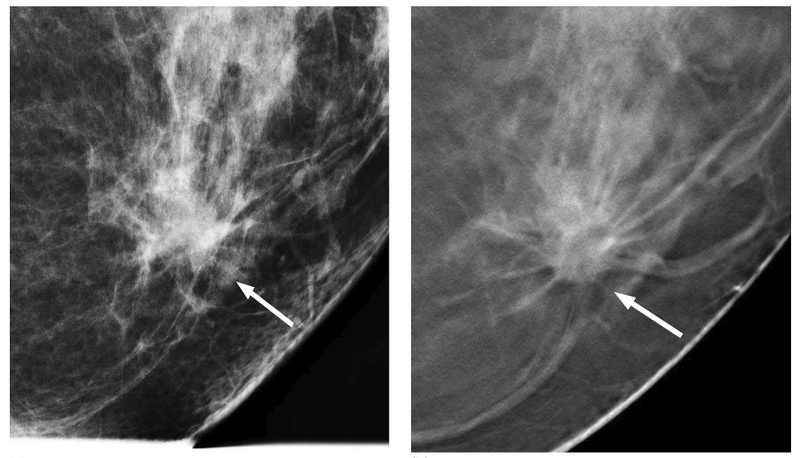 In the clinical example below, a low-grade invasive cancer of the ducts is seen in a standard 2D full-field digital mammogram (left) compared with one of the 3D slices created by DBT (right). It is evident that the DBT image has higher conspicuity and will probably perform better in dense breasts. Perhaps the most encouraging development with DBT is that carefully designed clinical trials have recently started to appear in quality peer-reviewed publications such as Radiology, The Breast Journal and Academic Radiology. The technology appears to be performing well in identifying small cancers, or micro-calcifications, as well as characterizing the texture of the branching ductal system. So, is DBT a panacea in breast cancer diagnosis? Probably not, but it is definitely a welcome addition to our armamentarium in the war on cancer.